1498 - Christopher Columbus sights Guyana. 1580 - Dutch establish trading posts upriver. 1620 - Dutch West India Company establishes a foothold in Guyana, including armed bases, and imports slaves from Africa to work on the sugar plantations. 1780-1813 - Guyana changes hands several times between the Dutch, French and British. 1814 - Britain occupies Guyana during the Napoleonic Wars. 1831 - Guyana officially declared a British colony. 1834 - Slavery abolished; many slaves leave plantations to set up their own freeholdings and are replaced by indentured workers mainly from India. 1879 - Gold is discovered in Guyana and is followed by an economic boom. 1889 - Venezuela lays claim to a large portion of Guyana west of the Essequibo river. 1899 - International arbitration tribunal rules in favour of Guyana (then called British Guiana) in the territorial dispute with Venezuela. Britain sent troops after blaming unrest on "communists"
1953 - Britain suspends Guyana's constitution, sends in troops and installs an interim administration after democratic elections for parliament produces a result not to its liking - a victory for the left-wing Indo-Guyanese Progressive People's Party (PPP). 1957 - Britain restores Guyanese constitution; PPP splits along racial lines, with Cheddi Jagan leading a mostly Indian party and Forbes Burnham leading a party of African descendants, the People's National Congress (PNC). 1961 - Guyana granted full autonomy, with Britain retaining control over internal and defence matters; Jagan of the PPP becomes prime minister. 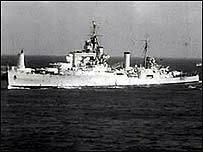 1962 - Venezuela revives its territorial claims on Guyana; Jagan introduces austerity programme, sparking off violent riots and a general strike; British troops sent in to restore order. 1963 - Racial violence between people of African origins and Indian supporters of Jagan. 1966 - Guyana becomes independent with Burnham as prime minister. 1970 - Guyana becomes a republic within the British Commonwealth with Raymond Arthur Chung as titular president. 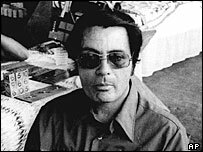 1978 - Nine hundred members of a religious sect commit mass suicide at Jonestown, a community established by sect leader Jim Jones. 1980 - Guyana gets a new constitution and Burnham becomes the country's first executive president. 1985 - Desmond Hoyte (PNC) becomes president following the death of Burnham; economy begins to deteriorate. 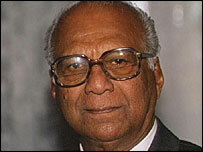 1992 - PPP wins first completely free parliamentary elections since independence; Cheddi Jagan becomes president. 1997 - Jagan dies and is replaced by his wife, Janet, after elections. 1998 - Government declares state of emergency in Georgetown in response to violent riots amid allegations of discrimination by PPP against Afro-Guyanese. 1999 - Bharrat Jagdeo becomes president after Janet Jagan resigned for health reasons. 2000 - Long-running dispute with Suriname over the offshore border comes to a head when Surinam gunboats evict an oil exploration rig from the area. Guyana had approved the exploration. 2002 July - TV presenter Mark Benschop charged with treason. Court says he encouraged protest in which presidential complex was stormed by demonstrators, who were complaining of discrimination against Afro-Guyanese. 2003 April - US embassy employee is kidnapped and released after a ransom is paid. The abduction is part of a wave of violent crime; the murder rate in 2002 quadrupled to more than 160. 2004 May - Home Affairs Minister Ronald Gajraj steps down to allow an inquiry into allegations that he is linked to a death squad accused of executing hundreds of suspected criminals. 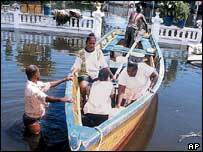 2004 June - UN sets up tribunal to try to resolve long-running maritime border dispute between Guyana and neighbouring Suriname. 2004 December - Jury at trial of TV presenter Mark Benschop, charged with treason in 2002, fails to deliver unanimous verdict, necessitating re-trial. 2005 January - Government declares the capital a disaster zone as severe flooding follows days of continuous rain. More than 30 people are killed. UN estimates loss to the economy to be $500m. 2005 April - Ronald Gajraj reappointed as interior minister after inquiry clears him of direct involvement in killings of known and suspected criminals. He resigns in May. 2006 April - Agriculture Minister Satyadeow Sawh is shot dead. The murder is part of a string of gun crimes. The ruling party says the killing is intended to incite pre-election violence. 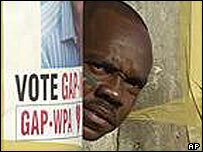 2006 August - President Bharrat Jagdeo wins another five-year term in general elections. 2007 June - Former Guyanese MP Abdul Kadir is arrested in Trinidad on suspicion of involvement in a plot of blow up New York's JFK airport. 2007 September - A UN tribunal rules in the Guyana-Suriname dispute over maritime territory, giving both a share of a potentially oil-rich offshore basin. 2008 July - President Jagdeo accuses the EU of using its economic might to 'bully' developing nations into accepting its terms in negotiations with 16 Caribbean countries over a trade agreement. 2008 October - President Jagdeo signs trade agreement with EU. 2010 October - Parliament abolishes mandatory death penalty for murderers, unless they have killed members of security forces. 2011 November - Donald Ramotar is elected as president. Ruling People's Progressive Party wins parliamentary election, but loses its majority. 2012 July - Three die as police clash with demonstrators protesting against electricity price hikes.